The Olympics are often a time of technical trials, not just for new workflows but for new technologies as well. The 2016 Olympics were no exception, and topping the list was an effort by NBC and Sony to cover the Opening Ceremony in 4K HDR on the video side and by NBC and Dolby to cover the Opening Ceremony using Dolby Atmos. 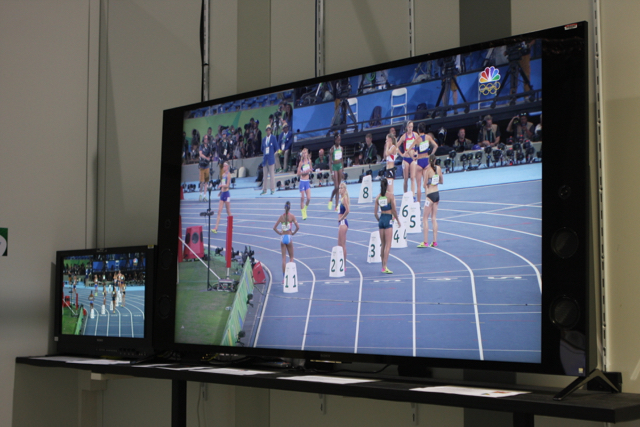 NBC Olympics set up an HDR viewing area that ran different demos (the one here shows how SDR material can be upconverted to HDR) to help Olympic staffers and guests understand concepts around HDR. A small engineering team from Sony helped build a small six-camera flypack outfitted with Sony HDC-4300 cameras. The HDR feed was shot in Sony’s sLog3 format, and BT.2020 color space. The sLog3-2020 signal was converted to ST2084-2020 with a target peak brightness of 1,000 nits and fed into HEVC encoders, where ST-2086 static metadata (commonly known as HDR10) was embedded for transmission to the U.S. in the PQ format. According to Chris Seeger, director, advanced content production technology, NBC Universal, the FujiFilm LUT converters came with a software interface very familiar to color correctors.